Follow @LACountyLibrary for a chance to win a mug during #LibraryLoversMonth! Do you love reading and social media? So do we! 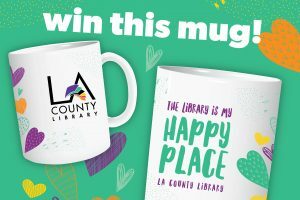 Follow @LACountyLibrary on Facebook, Twitter, and Instagram for chances to win a ceramic mug that tells the world The Library is my Happy Place. We’ll have a series of social media giveaways starting mid-February, in honor of Valentine’s Day, and National Library Lovers’ Month. Be sure to follow us on all platforms for multiple chances to win! Show off your passion for reading and libraries with this amazing ceramic mug! Simply comment on special posts and you’ll be entered into our giveaway. Staying in touch with LA County Library is easy with social media. You might learn about an upcoming event on Twitter, get book recommendations on Facebook, or see photos of what’s happening in our libraries on Instagram. Happy #LibraryLoversMonth, and good luck! During February 2019, LA County Library will host a series of giveaways on @LACountyLibrary social media (Facebook, Twitter, and Instagram). Promotional ceramic mugs will be awarded to randomly selected participants who comment on certain giveaway posts. Participants may comment on Facebook, Twitter, and Instagram with one entry per person and platform counted toward the giveaway. Winners will be notified via social media. Participants can only win 1 mug during promotion. Winners need to pick up the mug from their local LA County Library location; mugs will not be mailed. By commenting on giveaway posts, participants grant permission for the Library to use their social media handle or name in Library promotional materials; winners’ social media handles will be shared. If the winner does not pick up their mug within 3 weeks of being notified, they automatically forfeit their reward. No purchase necessary. While supplies last. This promotion is in no way sponsored, endorsed or administered by, or associated with Facebook, Twitter, or Instagram. LA County Library staff are welcome to comment, but are not eligible to win mugs.